“Greenmantle” is a spy novel written by John Buchan and published by Hodder and Stoughton in 1916. Set during World War One, “Greenmantle” is the second of the 5-book series of the Richard Hannay novels which immediately follow The thirty-nine steps, set a few months before the beginning of the war. In “Greenmantle”, Richard Hannay will fight an incredible German plot to win the war from the East, from the Orient, through the stirring of religious sentiment. “Greenmantle” never attained the fame of The thirty-nine steps. We think it's because it is lacking a good movie based on its story. It's never too late. Major Hannay is convalescing following the battle of Loos. He is slightly depressed: “I never could stand London during the war. It seemed to have lost its bearings and broken out into all manner of badges and uniforms which did not fit with my notion of it.” He receives a telegram from Sir Walter Bullivant, calling him to a meeting. Reluctantly, he goes to the Foreign Office and learns from Sir Walter that the Germans are plotting some ugly scheme in the Near East, in order to harm British interests and divert Britain's focus from the war towards its colonies. The clue comes from a piece of paper on which Harry Bullivant, Sir Walter's son, wrote three strange words just before his death: Kasredin, cancer, v.I. Hannay is given a contact: a mysterious American named Blenkiron. Hannay, Blenkiron and Sandy (his war friend who is also convalescing with him) then meet and discuss the challenge. They know they have to go to Constantinople, that it's about a German plot, but don't know much more than that. They decide to take three different routes and to meet at a specific place in Constantinople two months later. Hannay travels to Lisbon and impersonates a disgruntled Boer. Coincidentally he meets his friend Peter Pienaar and explains the situation to him. Together they play their unhappy, anti-British Boer roles so well that they are soon contacted by who they believe is a German agent. They are quickly whisked off to Germany. Once in Berlin, they meet with German officials who try to destabilise them. Colonel Von Stumm explains to them that the plot is about destabilising the Muslim world through a prophet dressed in a green mantle. Hannay has a few narrow escapes, he recognises a prisoner who knows him, but who understands Hannay is on a spy mission. Later Peter Pienaar goes on a drinking spree, and his outburst brings renewed suspicion onto Hannay, who once again has to deal with the problem. He then follows Stumm (the high German official who suspects Hannay and Pienaar) on a train to Bavaria, and coincidentally he meets the Kaiser (a bit like Arsène Lupin did in “813”. Stumm briefs Hannay on his mission; he has to meet a man in Egypt but in order to get there, he will have to take an unexpected route: Holland, back to London, and then sail to Cairo. Hannay realises he will never be in Constantinople in time. Then provoked by Stumm, he lashes out and attacks him by surprise: He renders the big German unconscious and leaves. Then starts one of those great escapes which has become a Hannay (and a Buchan) trademark. After multiple adventures in the middle of the snow (it is a Bavarian winter), Hannay finds refuge in a house with a single woman and her children, and hides there for four days, allowing him time to recover from a sudden malaria spur. He leaves the house, avoids the sentinels, finds the Danube and enrols in a convoy of barges. Not long after that, he finds Peter Pienaar who also tells him his story. They finally arrive in Constantinople and make the meeting at the Greek's café (the point of encounter mutually agreed at the beginning) on time, but don't find anyone. They are subsequently followed and attacked by Rasta and his men, rescued by a bunch of dancing men and later, chased by them. They return to the Greek café to finally find out that the leader of the dancing men is Sandy himself. We finally get to learn more about Greenmantle: a cunning German plot to stir up Islamic passions in the Near East and assume power there. Greenmantle is a prophet, they suppose. But they then wonder whether it might be a beautiful and strange lady: Hilda von Einem. They decide to go to Mesopotamia. Richard Hannay then becomes Richard Hanau (thanks to Blenkiron, who has also caught up with them), an American engineer of German descent who offers to help the Germans in their campaign in Mesopotamia. Hannay and Pienaar go horse-riding in Turkey, and after a few skirmishes they finally meet Hilda von Einem, the lady with the black mantilla. However Rasta, who happens to be here, recognises him. Hannay takes care of him, and leaves him in a cupboard. Then they escape once again, steal a car, avoid a few bullets and head for Erzerum, the Euphrates and Ararat. And then who do they meet? Stumm again! He puts them under arrest. Hannay manages to steal Stumm's military map and then, thanks to Hussin (their help who had disappeared) they escape again, and climb on the cupola of a mosque... Hannay has time to examine the map: it is a detailed map of the battlefield with the Turkish army facing the Russians. Pienaar sneaks beyond the Turkish line and delivers the map to the Russians. 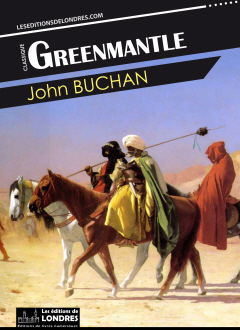 Even if the book can easily be criticised for its cliché portrayal of the evil Germans and the herd-like masses of Turkey or the Near East, and also for its long list of unlikely coincidences and chain of events, “Greenmantle” is a very good book. The book is split into two: the first part, i.e. the spy novel part which lays out the plot, follows Hannay to Lisbon, where he smartly impersonates a Boer, immediately a target for recruitment by German agents then is whisked to Berlin through the Netherlands, is interrogated by von Stumm, meets the Kaiser... The second part, or the adventure novel part, starts after Hannay has escaped and hides in a snow-covered Bavarian forest, and takes us to Constantinople. We find part one to be probably superior to most of The thirty-nine steps, and part two to be inferior, as more comic-book like and sometimes hard to believe. It is said Alfred Hitchcock preferred “Greenmantle” over The Thirty-nine steps and thought of turning it into a movie, but never did. Overall, even if “Greenmantle” has disappeared from most memories, this is not fair, as the recent political events of the last ten years make its plot and use a prophet to stir up religious fanaticism for political and military purposes, to appear “sensitive”. Some critics say that “Greenmantle” has the potential to arouse passions in our troubled times, filled with fears of terrorism, of associations of Muslims with terrorism, and regularly with terrorist acts often committed in the name of religion. This is nonsense. First, there is nothing neither sensitive nor “modern” about “Greenmantle”: the action is very much rooted in World War One, and the German plot of playing with religious passions as a driver of rebellion seems very plausible, and in no way “prophetic”. Second, there is nothing that original about the idea itself: Sudan erupted against British rulers with the rise of the Mahdi, and the idea of Islamic sentiments fuelling political agitation has happened across North Africa, the Near East, and the Middle East throughout the Twentieth century. The increasing industrial world lust for oil after the Second World War just made matters much worse. What is probably more interesting but more unnoticed in our politically correct times is the portrayal of the Germans. We are not so much talking of the depiction of the characters, mentioned earlier, but rather the description of the tendency of the German politicians or military to verge towards the fanatic: “Her pale eyes had the cold light of the fanatic. With her bright hair and the long exquisite oval of her face she looked like some destroying fury of a Norse legend.”; “Old Nietzsche has been blamed for a great deal of rubbish he would have died rather than acknowledge. But it's a craze of the new, fatted Germany.” Interestingly, this kind of description of the aristocratic German as a fanatic from Norse legends also appears in novels of the same period, between authors not necessarily connected (example: same language in some of the Arsène Lupin wartime novels by Maurice Leblanc): we believe it clearly expressed a commonly accepted view about German fanaticism in Europe at the time. Some scenes of “Greenmantle” evoke Raiders of the lost Ark with its megalomaniac and twisted Nazi plots to use the power of faith in order to subdue entire populaces, the warped characters such as Hilda von Einem, and this strange craving for exoticism. It's as if the absence of colonies had created this esoteric rather than exotic urge for the German Empire.